What can you do on the Mother's Day that is coming up this Sunday? Get her a present, taking her out lunch, go picnic ... Well, you can also bake her some sweets to melt her heart. That's what I am going to do anyway. 1)	Preheat the oven to around 150°C (plus/minus about 5°C depend on your oven. Just make sure it is not too high). Grease the bottom of the cake pan and line with baking paper and grease the baking paper and side of the pan and dust with cocoa powder. 2)	Double boil the chocolate and butter. Make sure you double boiler is simmering, not boiling and the bowl should not touch the water. You will overcook and burn the chocolate if the water is boiling. Then cool the chocolate mixture slightly. 3)	In a large bowl, beat the egg yolks, sugar, espresso (if using), vanilla, mint (if using) and salt together until pale and very thick. Then gradually pour chocolate mixture 2 into it and continue beating until well blended. 4)	In another clean bowl (try to use stainless steel or a glass bowl, not the plastic one. They not good for beating egg whites), beat the egg whites until foamy (soft peaks form), then slowly add in the 2tbsp sugar into the egg whites. Continue beating the egg whites until medium-stiff peaks form (really thick and firm). Make sure you don't over beat the egg whites, if you over beat it, you will need to start all over again. There is no way to save over-beating egg whites. 5)	Then scoop and gently fold (not stir) in the egg whites into the chocolate mixture 3. Do this in two batches (ie. Do not put the whole egg whites into the chocolate mixture at one time, split them into two batches). Remember need to be gentle, rough mixing will cause the egg whites form to break down. 6)	Pour mixture 5 into cake pan prepared in Step 1 and spread evenly. Bake until the cake puffs slightly and use a toothpick, insert into center of the cake and it is ready when the toothpick comes out very moist (some chocolate batter will stick to your toothpick) but not liquid. Remember, this is flourless cake, that's why it won't come out clean. When I made this, it took me around 35 minutes. Do not overcook it. Once the cake is done, let it cool for at least 30 minutes. I left the cake for 3 hours at this stage. 7)	Once the cake is cool, run a table knife around the edge of the pan and loosen the cake. Carefully peel off the baking paper and let the cake cool down completely. Cover the cake and refrigerate until really cold, at least 4 hours. I left my cake in the fridge overnight. 8)	Finally glaze the cake with chocolate glaze, then you refrigerate the cake again for at least 2 hours until the glaze is firm. Pour the glaze over the center of the cake and it should slowly spread over the edges of the cake. 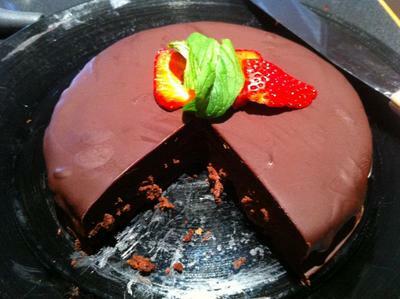 Then you will have your perfect Flourless Chocolate Torte. Tip to cut the cake: Dip the knife into hot water and wiping it dry before each cut. Double boil the chocolate and butter until well blended. Remove from the heat and whisk in light corn syrup (or glucose syrup) to make your glaze looks shinny. Remember when double boil the chocolate, only simmering water not boiling and the bowl should not touch the water. Tip to spoon the corn/glucose syrup: Apply a thin layer of oil onto your spoon. This will prevent the syrup stuck to your spoon. Overall, this is actually a really easy recipe. I guess the hardest bit is the forming of the egg whites and the temperature. Make sure you get the egg whites form texture right (medium-stiff peaks) and your temperature right. And apparently these are the two key aspects of making Macaroons. I will write out my experience and instruction on making Macaroons next time. But for now, enjoy this Flourless Chocolate Torte and have fun in the kitchen. Good luck. Why? Bake her some sweets to melt her heart.